Well hello there, gems. I'm back from China and am getting back on Minneapolis time. Very slowly. Happy Sunday. Let's talk Sundays. They're slowly creeping their way into my hearts. Growing up, I hated Sundays. It meant the weekend was almost over, that I had to do my homework and that I had to go back to school the next day. As an adult (if I do say so myself), I'm starting to dig them. In my book, Sundays truly are a day of rest and relaxation. And when possible, I prefer to start them with brunch + cocktails. Truth be told, I'm a mimosa girl myself. But every once in a while, I gotta have a bloody Mary. And on the days where I'm foregoing champagne (my true favorite), I've got to have the very best. 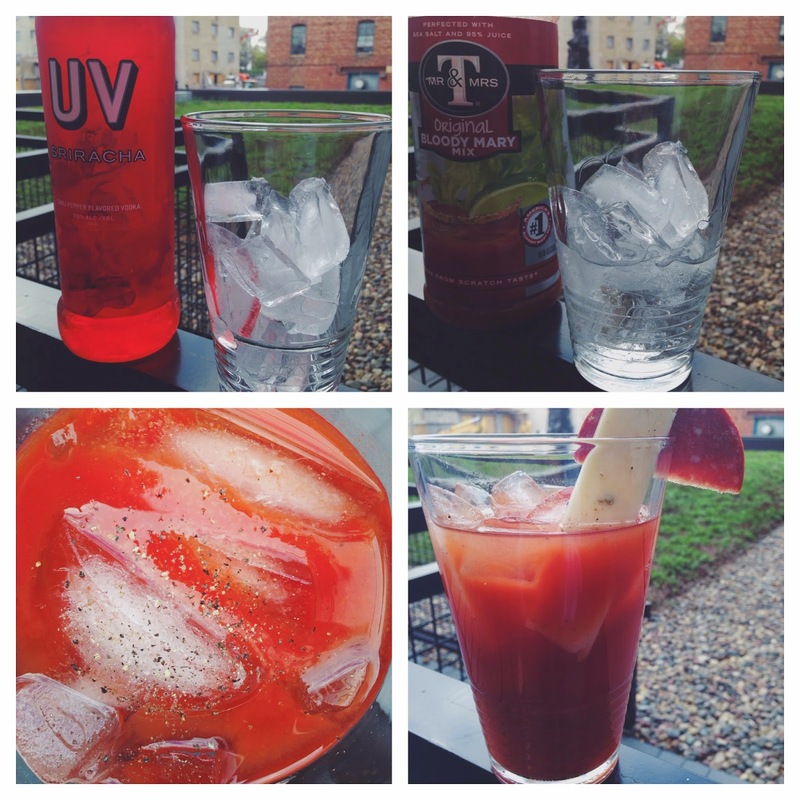 A few weeks ago, UV Vodka sent me a bottle of one of their newest flavors, sriracha vodka. A sriracha lover, I needed to give it a try. And while my parents were in town a few weeks ago, a bloody Mary before Mothers Day brunch/my sister's birthday was exactly what we needed. First things first, I am not the best bloody Mary maker in the world. However, I had the best ingredients (thanks, UV Vodka! ), and the perfect toppings. In my opinion, if you can't make it, fake it. Thankfully, this bloody passed the test! As I'm working hard to get back on Minneapolis time and get organized for work this week, I might be making one of these for myself. Drinking at any time on Sundays is acceptable, right? This one's easy. Mix everything together, and garnish with your cheese/meat of choice. Enjoy!